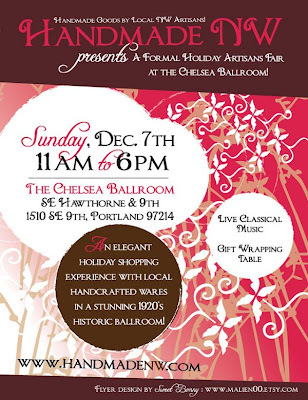 I'm very excited to be selling my goods at Handmade NW's super fancy, elegant & lovely craft show & sale this Sunday! Stop by to say "Hi." Why formal? It's in a historic 1920's ballroom, with live classical music. A wide range of local artisans will be there, and once you've selected your gifts, you can stop by the gift-wrapping table and get them all packaged up. Proceeds from the gift wrapping, by the way, will benefit Habitat for Humanity.